It’s actually comics BY women—and I mean, top to bottom: written, penciled, inked, colored, lettered. The logo is by a woman, all the interior design, production, proof-reading and editing is all by women. Although some creators have gravitated towards their favorite female super hero, it’s not specifically focused on our female characters, and I’m not trying to generate content that I think will appeal to more women. I don’t want to give away all the stories, but we’re really running the gamut of Marvel characters, from Punisher to the FF to Mary Jane. We’re making great comics by great women, period—when given the opportunity to create a story about whatever they wanted, the pitches I got back from everyone have been hugely diverse in tone and characters. Contributors include Kathryn Immonen, Marjorie Liu, Devin Grayson, Ann Nocenti, Trina Robbins, G. Willow Wilson, Stephanie Buscema, Amanda Conner, Jill Thompson, Louise Simonson, Valerie D’Orazio, Colleen Coover, Molly Crabapple, Nikki Cook, Ming Doyle, Abby Denson, and Carla Speed McNeil. Louise Simonson? Ann Nocenti? Ming Doyle? Jill Thompson? AMANDA CONNER?! All female creators, writing about superheroes. There's no pushing towards female characters or girly stories, just the stories female creators wanted to make. With a stupid name, yes, but someone's even found a historical reference there. 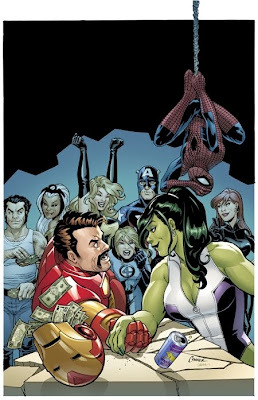 This... might actually be a good idea... come up with by Marvel.